Not Chilean, born at Brookdale. What a big leggy thing! That's so exciting! That colt really does have some adorable markings. Yeah and it looks like Pharoah puts some nice muscle on his babies too. Wow! That colt is really good looking. If the APs continue to drop looking like this then 2019 and beyond is going to be exciting indeed! I have been posting Comments on new foals there. This is the original thread created for the purpose of 2017 foal photos; while titled slightly different - 2017 Foals - is a duplicate. If this is the type of foal he is going to sire, watch out! This initial photo screams quality. I keep looking at his photo, he is just so darn nice. 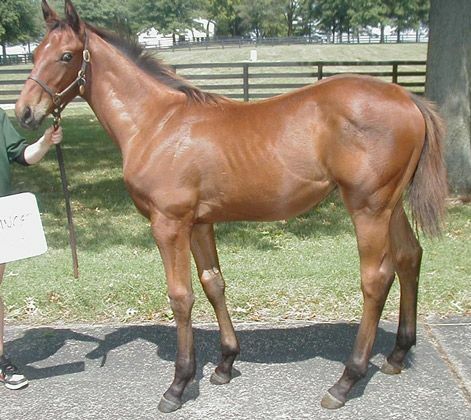 If I had a mare in foal to AP, after seeing this photo, my already heighten expectations would have spiked today, lol. If there were any "in hiding", today (January 1, 2017) is a good day to make a foal announcement. Also....waiting for that first 2017 foal photo. A Carpe Diem seizing the day on January 1. Grade 1 winners Awesome Maria and Joyful Victory. American Pharoah, a 5-year-old son of Pioneerof the Nile, stood that initial season for an advertised fee of $200,000. He will stand for a private fee in his second season when Kentucky breeding sheds open in mid-February. "It's very exciting," said Fred Seitz Jr. of Brookdale Farm. "For a first foal, he's a very nice, very attractive type. Personality wise, I think he seems like he's going to take after his dad with that mellow-type personality. Most babies are kind of skittish and want to run around behind their mother but he's not that type. You walk in the stall and he comes right up to you and starts chewing on your hand. He seems to be real bold and have that fun personality. "He's what you look for if you're breeding Thoroughbreds, I think." Let us hope there is an adult very nearby. I don't care how gentle a foal is, that is irresponsible parenthood to put baby in harm's way; no fault of foal. I' pretty sure and adult was near by otherwise why would there be a pic? At arm's length. What if foal suddenly got up? Just don't like it, no matter how "cute". He's the son of the people who own the farm. They've been tweeting photos and they are all close by. I'm sure it's fine. Actually, don't know if they are the owners, but are involved in some way. Lol! Maybe they own the mare? Anyone know?